We first experienced migas when we road-tripped through Austin last summer. I'd never heard of migas before, but I was an instant convert. Migas are very much like, but intriguingly different from the chilaquiles we enjoy here in San Diego. Migas, as American food at least, seem to be pretty Austin-specific. Historically, though, the dish is Spanish/Portuguese in origin. The key elements seem to be leftover stale bread and pork product of some kind. 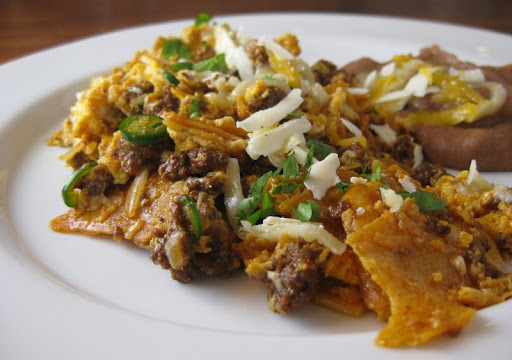 In Austin, the bread is replaced with corn tortillas, the the pork product is likely to be chorizo, and eggs make it a breakfast dish (hence the likeness to chilaquiles). Regardless of the origin and the transformation, chori-migas are awesome! Here, I just want to add a frustrated photographer mini-rant. I have found it to be *very* hard to get a good picture of chorizo cooking. The darkness of the chorizo against the black background of frying pan is very unforgiving. Add in that this is all happening on our stove, which is not the best lit environment, and you have a very non-photographer-friendly environment. The plus side is that, while it might not be very photogenic, it does taste really, really good! From there, you are very much in your just-making-scrambled-eggs-comfort-zone. It can be done better or worse, but it is hard to truly mess up. If you must ask, however, I do like my scrambled eggs on the soft-set-up side. Then it is to the plate. We garnish with sliced jalapeños and some shredded cheese. 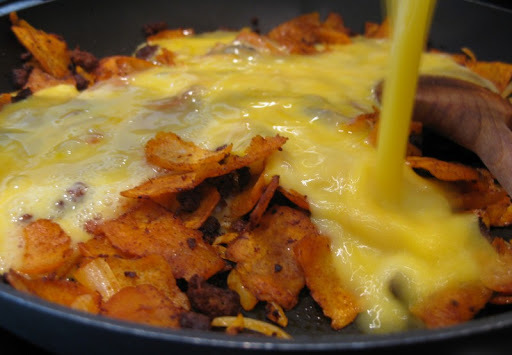 We keep the cheese simple - mild jack or cheddar - since the flavor complexity is coming from elsewhere. Plus, Austin might just be the epicenter of unapologetic use of yellow cheese, so don't you worry. 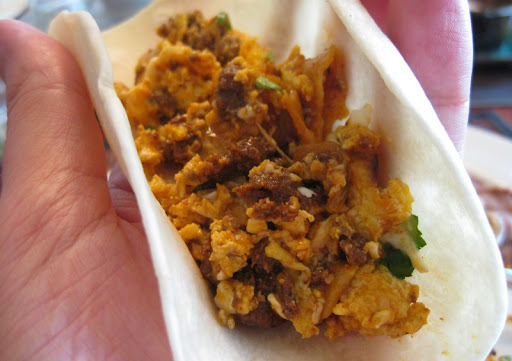 Chori-migas eaten straight-up are pretty damn good, but our favorite breakfast delivery vehicle is the chori-miga-taco. We like to use flour tortillas, since we already have corn tortillas in the filling. Pop your migas in, add some salsa if you like (I like a bit of pico-de-gallo, not yet added in the picture above) and enjoy your breakfast! We start by cooking the chorizo whole and removing the casing once the sausage is cooked through. This results in decent sized chunks of meat in the end product. 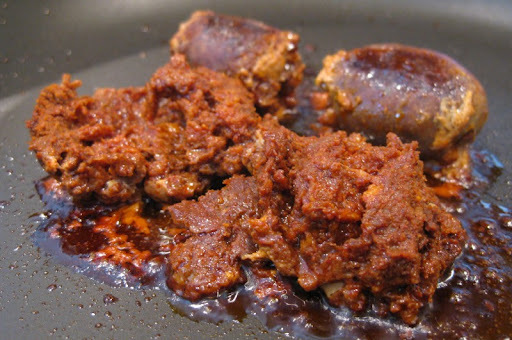 If you like, you can remove the sausage from its casing prior to cooking, however you will end up with smaller, finer pieces of cooked chorizo. Heat the oil in a non-stick frying pan until medium hot. Add the chorizo and cook, turning frequently until the sausage is bursting from its casings. Use scissors or a small knife to slit the casings and tongs or a fork to remove them from the pan, leaving the meat and oil behind. 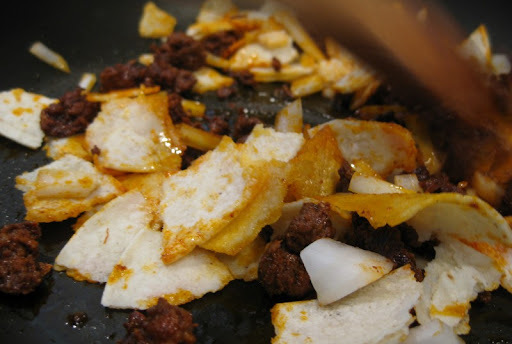 Add the tortillas and stir well to coat them in the flavored oil. Cook a minute or two, then add the onion and cook for another couple of minutes until some of the tortillas begin to crisp and the onion has softened. Sprinkle everything with salt, then stir in the garlic and cook another 30 seconds. 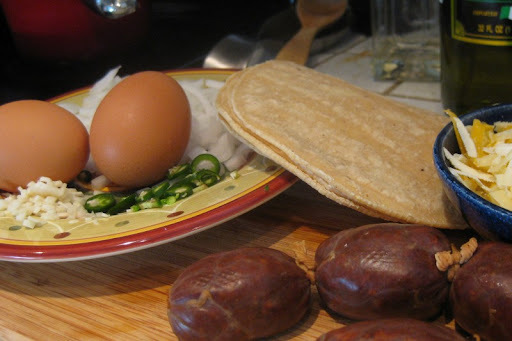 Pour the eggs over the chorizo-tortilla mixture, and use a rubber spatula to stir gently until the eggs are set, but still moist. Fold in some of the chile slices, then serve on warmed plates. Garnish with a little cheese, more chile slices and some finely chopped cilantro if desired. This looks incredible! Thanks for sharing the recipe! Yowza - that looks delicious!